kalleo will empower you to take your mobile number back from the constant spam and robocall abuse. kalleo will block robocalls, spam and phishing scheme and will fully identify incoming phone calls. kalleo only takes a minute to set up for a lifetime of uninterruption and transparency. Simply “Deny to Identify” and take back your phone experience. 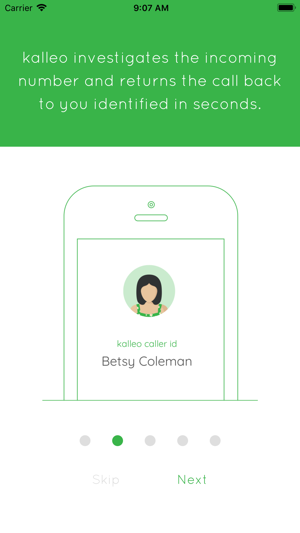 By forwarding your phone number, kalleo is able to function as a service and work outside the limits of your phone while maintaining your privacy. This enables better identification, call blocking, and the ability to choose when you want to be contacted. Another benefit of the call forwarding approach is that it works for all carriers. 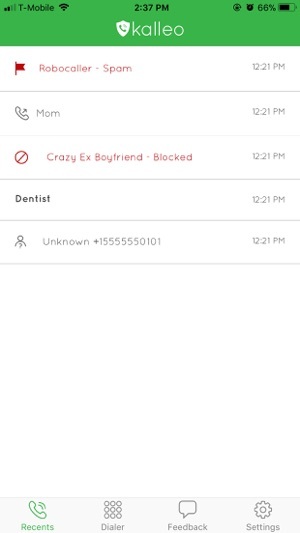 Blocks known spam callers and scammers from getting through instead of just sending them to voicemail. Fully identifies incoming, unknown callers for complete transparency. No more full mailboxes. 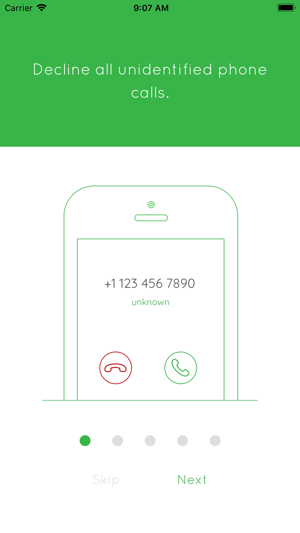 Never miss an important voicemail again. All voicemails are text to you so you can share anytime. Flag new spam callers and contribute to a spam-free community. Every time you help kalleo identify new spam callers, the entire community benefits. Security and privacy is a top priority. kalleo will never sell users’ information for profit or use that information for anything other than what’s intended. Also, every incoming call is encrypted, keeping your calls private. Phone number and Kalleo can’t stop those. 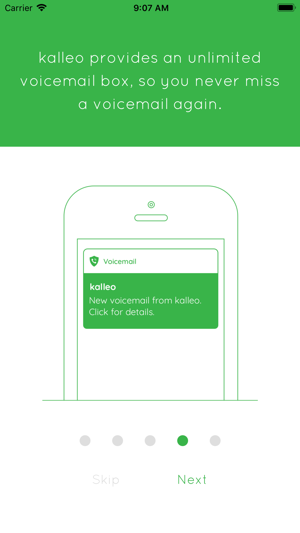 Kalleo ALSO uses a call forwarding procedure for voicemails so you no longer receive voicemails on your phone with your own carrier. Instructions to deactivate do NOT work - to stop the voicemail call forwarding you go to their web site and call a number dependent upon your carrier to deactivate. I can say this does not work - or at least hasn’t worked with my carrier Sprint - thus I’m in a quandary of trying to get out of this useless app and get my VM back. This is one of the most useful apps I have downloaded lately. I love that I don’t have to guess as to who might be calling me, & gamble on answering a robo call!! Glad to get some control on my phone Back!